(Vatican Radio) If we keep our eyes constantly fixed on Jesus, we will discover with surprise that it is he who looks lovingly upon each of us. That was Pope Francis’ message on Tuesday at his morning Mass in the Casa Santa Marta. Thursday 2: Feast of the Presentation of the Lord, 21st World Day of Consecrated Life. At 5.30 p.m. in the Vatican Basilica, Holy Mass with the members of the Institutes of Consecrated Life and the Societies of Apostolic Life. Wednesday 1: Ash Wednesday. At 4.30 p.m. in the Church of St. Anselm, Statio and penitential procession. At 5 p.m. in the Basilica of St. Sabina, blessing and imposition of the Ashes. Sunday 5: First Sunday of Lent. In Ariccia, beginning of the spiritual exercises for the Roman Curia. Friday 10: Conclusion of the Spiritual Exercises for the Roman Curia. The Holy Father was quoting from Saint Paul’s First Letter to the Thessalonians during his weekly General Audience in the Paul VI Hall where he continued his catechesis on Christian hope. The Pope recalling the freshness and beauty of this first Christian proclamation described the community of Thessalonica at the time as one “ rooted in faith which celebrated with enthusiasm and joy the resurrection of the Lord Jesus”, despite its difficulties and the many trials. Christian hope, the Pope continued, "is the expectation of something that has already been accomplished, and that will certainly be realized for each of us." Giving an example, he spoke of the woman who when realizing she is pregnant, waits every day for the arrival of her baby. (Vatican Radio) Pope Francis’ prayer intention for February is to Comfort for the Afflicted: That all those who are afflicted, especially the poor, refugees, and marginalized, may find welcome and comfort in our communities. In a press conference today, the government of the Sovereign Order of Malta has outlined its priorities, following the resignation of Grand Master Fra’ Matthew Festing on Saturday 28 January. The Grand Chancellor Albrecht Boeselager stated: “Together with the Lieutenant ad interim we are governing the Order according to our constitution and in a united and efficient way”. The government emphasized the Order’s loyalty to the Holy Father. It confirmed the Order’s willingness to collaborate with the Special Delegate. On behalf of the government, Boeselager thanked Pope Francis for his guidance that helped end government crises. He observed that in all his decisions the Pontiff showed respect and regard for the Order of Malta, while at the same time acknowledging in all his actions, the sovereignty of the Order. The election of the Grand Master’s successor will take place within the next three months, as provided for in the Constitution of the Order of Malta. The Lieutenant ad interim, Fra’ Ludwig Hoffmann von Rumerstein, will convene the Council Complete of State, the electing body, which is made up of an international representation of members of the Order. They will meet in the Order’s Magistral Villa in Rome. (Vatican Radio) Pope Francis on Thursday celebrated Mass for the feast of the Presentation of the Lord in St Peter’s Basilica in Rome. Members of Institutes of Consecrated Life and of Societies of Apostolic Life participated in the Liturgy. The Mass also commemorates the World Day for Consecrated Life. On this day, the Church celebrates and prays for those who have consecrated their lives to God by the vows of chastity, poverty and obedience. The World Day for Consecrated Life was established in 1997 by Pope Saint John Paul II; 2017 marks the twenty-first annual observance of the Day. The liturgical feast chosen for the commemoration celebrates the presentation of the newborn Jesus in the Temple by Joseph and Mary forty days after His birth, in accordance with the law of the Old Testament. The feast is also known as “Candlemas” on account of the blessing of candles and the procession that takes place at the beginning of the Mass. The candles blessed during the Liturgy thus symbolize both Christ, who is the Light of the World; and the lives of consecrated women and men who are called to reflect the light of Christ for all peoples. (Vatican Radio) Pope Francis sent his greetings on Friday to the participants in the XVI World Summit of Nobel Peace Laureates, taking place from 2 to 5 February in Bogotá, Colombia. Pope Francis encouraged participants “in their efforts to promote understanding and dialogue among peoples”. The Holy Father concluded his message invoking ‘blessings of wisdom and strength’ on all participants. The message was written by the Vatican Secretary of State, Cardinal Pietro Parolin, and sent through the Apostolic Nuncio to Colombia, Archbishop Ettore Balestrero. ROME- After weeks of turmoil that saw Pope Francis, the Vatican and the Sovereign Order of the Knights of Malta locked in a power struggle, a top official of the order now says they won’t let the crisis deter them from their humanitarian work, particularly with immigrants and refugees. The Order of Malta “is not fighting the pope,” said Albrecht Boeselager, the Grand Chancellor of the Knights of Malta, who was fired last December but reinstated on Saturday after the resignation of Grand Master Matthew Festing. Boeselager contested impressions that Francis essentially sacked Festing. Boeselager said there was never any actual consideration of the order removing Festing, because the Knights were caught off guard and had not expected the crisis to escalate. Regarding the future role of American Cardinal Raymond Burke, currently the patron of the order, but who throughout the crisis sided with Festing, the Grand Chancellor said he couldn’t comment because he didn’t know. At the moment, Burke’s role is that of spiritual leader and liaison between the order and the Vatican. Yet according to a letter sent by the pope to the Order’s general council, Francis will soon be appointing a papal delegate who will be the point of reference between the Knights and the Vatican. Matthew Festing resigned as Grand Master last week after a meeting with Pope Francis, a move that signalled his capitulation in a very public battle between the knights and the Holy See. But speaking to The Tablet, Festing has stressed the complex dispute is far from over, raising the possibility of him trying to make a comeback as Grand Master or even a legal challenge to the validity of his resignation. The former Grand Master resigned following a bitter dispute with the Vatican sparked by Festing’s sacking of his number three, Albrecht von Boeselager in a row about the distribution of condoms. The dismissal was backed by Cardinal Raymond Burke, the Order’s patron and prominent critic of Pope Francis, who claimed with Festing that the action was the wish of the Holy See. This turned out to be incorrect and following a Vatican investigation Festing stepped down and von Boeselager was reinstated. Cardinal Gerhard Müller, the Prefect of the Congregation for the Doctrine of the Faith, has given a new interview in which he has made some comments with regard to the papal document Amoris Laetitia, and which may now be seen as an indirect response to the Four Cardinals’ own dubia. 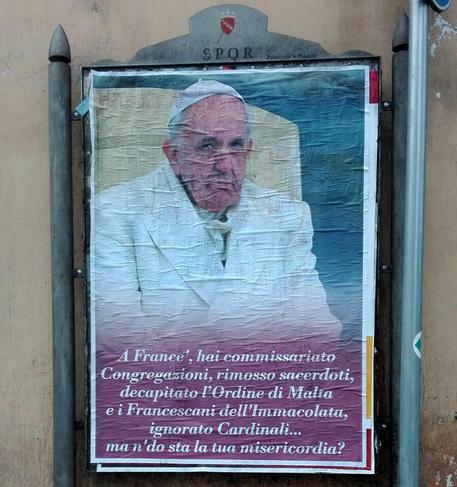 ROME- On Saturday, posters appeared around Rome featuring a stern-looking Pope Francis and asking “Where’s your mercy?” The unsigned images referred to the “decapitation” of the Knights of Malta and other actions Francis has taken against groups and individuals perceived as conservative. “Ah Francis, you’ve taken over congregations, removed priests, decapitated the Order of Malta and the Franciscans of the Immaculate, ignored Cardinals… but where’s your mercy?” it reads. All around the Vatican in Rome, but also in several other venues, many of the posters were quickly removed or covered by another, smaller one that said they were “Illegal Postings,” but by then the impression had already been made. Though there’s no logo on the image, nor any clue as to who might be behind them, the content of the poster makes it clear that they come from conservative, if not traditionalist, quarters within the Catholic Church, many of whom feel ostracized, ignored and even attacked by the more progressive Argentine pontiff. (Vatican Radio) Pope Francis has named Archbishop Angelo Becciu as his personal special delegate to the Sovereign Order of Malta. In a letter Saturday addressed to Archbishop Becciu, Substitute of the Secretariat of State, the Pope gives him “all necessary powers” to help the Order reform its Constitution and elect a new leader. Naming Becciu “as my special delegate to the distinguished Order” of Malta, the Pope emphasized that he will work in “strict collaboration” with the Order’s interim leader, Fra' Ludwig Hoffmann von Rumerstein. “You will be my exclusive spokesman” in everything relating to relations between the Order and the Vatican” and “I delegate to you, then, all the necessary powers to determine any issues that may arise concerning the implementation of the mandate entrusted to you” the letter said. The appointment of Becciu falls shortly after Festing’s resignation on January 24 from his position as Grand Master at the request of Pope Francis, and the reinstatement of ousted leader Albrecht von Boeselager as Grand Chancellor. Though no dates have yet been set, at a press conference highlighting the Order’s priorities this week, Boeselager said the council is expected to take place in late April. Re-instated Grand Chancellor Albrecht von Boeselager outlines his priorities as Pope Francis appoints his Special Delegate to the ancient chivalric Order. The Holy Father was speaking to participants of a meeting to mark the 25th anniversary of the founding of Economy of Communion. Associated with the Focolare Movement, the project sets up businesses that follow market laws, but pool the profits in communion. The Pope commended the organization for holding their profits in communion, and warned about the danger posed by money. He said the “goddess fortune” has become the divinity of a hazardous financial system which is destroying millions of families around the world. Pope Francis said the Economy of Communion, if it wants to be faithful to its charism, must not only take care of the victims, but also build a system where the victims are fewer and fewer, until maybe there are no longer any. “As long as the economy still produces one victim and there is still a single discarded person, communion has not yet been realized; the celebration of universal fraternity is not full,” he said. (Vatican Radio) Pope Francis has urged all believers to respond to “the logic of waste and demographic downturn” by upholding and promoting a “culture of life”. Speaking to the crowds gathered in St. Peter’s Square after the recitation of the Angelus prayer, the Pope marked Sunday’s celebration in Italy of the “Day for Life” with a call to join Italian Bishops in promoting a culture of life in which “no one is left alone”. During his catechesis, the Pope referred to the Gospel reading of the day that tells of the Sermon on the Mount and urged Christians to preserve society from corruption and gossip. Cardinal Gerhard L. Müller, Prefect of the Congregation for the Doctrine of the Faith, speaks on the meaning of doctrine and its relationship with personal conscience, ecumenism and the interpretation of "Amoris Laetitia". Editor's note: The following interview appeared in the February 2017 edition of Il Timone and was conducted by Riccardo Cascioli and Lorenzo Bertocchi. The translation is by Andrew Guernsey. Amoris Laetitia? "It should be read as a whole, in any case, adultery is always a mortal sin and the bishops who stir confusion on this should study for themselves the doctrine of the Church. We must help the sinner to overcome the sin and to repent." The unity of Christians? "It is important, but it cannot become relativism, one can not sell out the sacraments instituted by Jesus." Cardinal Gerhard Ludwig Müller, Prefect of the Congregation for the Doctrine of the Faith, weighs in with utmost clarity upon the hottest topics of ecclesial debate and beyond. We met him in the rooms from which he directs what once was the Holy Office, the place with custody of sound doctrine. We were greeted with great cordiality. His role of defender of Catholic orthodoxy, combined with an imposing physique and Teutonic [German] origins elicited a certain reverence, but it was quickly overcome by the Cardinal's cheerfulness and accessibility. We sit around the table; the theme is doctrine, the role it has in the Christian life, knowing we were broaching an unpopular topic. “By participating in sport, we are able to go beyond our own self-interest - and in a healthy way - we learn to sacrifice, to grow in fidelity and respect the rules. May this year's Super Bowl be a sign of peace, friendship and solidarity to the world” he said. The 2017 Super Bowl takes place in Houston and features the final NFL showdown between the New England Patriots and the Atlanta Falcons. Great sporting events like today's Super Bowl are highly symbolic, showing that it is possible to build a culture of encounter and a world of peace. By participating in sport, we are able to go beyond our own self interest - and in a healthy way - we learn to sacrifice, to grow in fidelity and respect the rules. May this year's Super Bowl be a sign of peace, friendship and solidarity to the world. (Vatican Radio) Pope Francis said Mass in the chapel of the Casa Santa Marta on Monday morning. In remarks to the faithful following the readings of the day, the Holy Father focused on the theme of Christian freedom, saying that the follower of Christ is a “slave” – but of love, not of duty, and urging the faithful not to hide in the “rigidity” of the Commandments. The Pope took the Responsorial Psalm, 103 (104) as his starting point: a “song of praise” to God for His wonders. “The Father,” said Pope Francis, “works to make this wonder of creation and with His Son to accomplish this wonder of re-creation.” Pope Francis also recalled an episode in which a child asked him what God was doing before He created the world: “He was loving,” was the response. (Vatican Radio) The 500th anniversary of the Protestant Reformation offers Catholics and Lutherans an opportunity to take further steps towards reconciliation and full Christian unity. That was Pope Francis’ message on Monday to an ecumenical delegation from Germany, led by Cardinal Reinhard Marx, president of the German bishops conference, and top Protestant Bishop Heinrich Bedford-Strohm, chairman of the Evangelical Churches in Germany (EKD). Reflecting on the 500th anniversary of the Reformation , he said it’s an opportunity to put Christ back at the centre of their ecumenical relations. Just as the question of a merciful God was the driving force of Luther and the other Reformers, so it must be at the heart of our joint efforts to propose the radical truth of God’s limitless mercy to men and women today. Speaking of the tragedy of divisions and conflict, fomented by political interests, the Pope praised the initiative of the German delegation to hold an ecumenical service of penitence and reconciliation entitled “Healing memories – witnessing to Jesus Christ”. Catholics and Lutherans will also be participating in other joint events this year, he said, including a shared pilgrimage to the Holy Land, a congress to present new translations of the Bible and an ecumenical day dedicated to shared social responsibility. (Vatican Radio) Pope Francis on Tuesday said that God created man in His image, made him lord of the earth, and gave him a woman at his side to love. The Pope’s words on these three gifts of God in Creation came during his homily at daily Mass in the Casa Santa Marta. The Holy Father’s homily at Mass focused on the verses of Psalm 8: "Lord, what is man that you are mindful of him? Yet you have made him little less than a god, crowned him with glory and honor,” and on the Book of Genesis’ account of the Creation of man and woman. The Pope spoke about the first of three great gifts, which God gave humanity in creation. "First of all, He gave us His 'DNA', that is, He made us children, created us in His image, in His image and likeness, like Him. And when one makes a child, he cannot take it back: the son is made, he exists. And whether or not he carries resembles the father, he is a son; he has received his identity. If the child is good, his father is proud of that son, right?, 'Look at how good he is!'. And even if he is a little ugly, the father in any case says: 'Isn’t he beautiful! ', because a father is like this. Always. And if the son is bad, the father justifies him, waiting for him ... Jesus taught us how a father waits for his children. He gave us the identity of a child: to 'man and woman', we must add the identity of ‘child’. We 'are like gods', because we are children of God." Below find the English language translation of Pope Francis’ Lenten message.